If you already have an online business or a website, this is a chapter that will show you how and why you should implement blogging into your business strategy. Business blogging is a strategy used in online marketing where the goal is to use blogging to improve your online business. In this case, a blog becomes an online marketing tool for a company that uses it to support its business growth. As a marketing tactic, business blogging brings many benefits to online businesses. The first, and the most prominent one, is generating traffic. Various studies have confirmed that companies that blog regularly generate more traffic and more visibility. Every time you publish a new blog post, you create more material for search engines to index, and you increase chances of these pages being shown in the search results. You also create an extra material to share on social media, in a newsletter, etc. Each new content material represents more value to your audience, and it helps you increase your online influence. Once you have traffic, you also get an opportunity to convert that traffic into leads. One way to do so is by providing lead generation CTA within each blog post. Blogging helps you create your online presence in multiple ways. To begin with, it helps you develop materials that can get your links in the search engine results. Increasing search engine visibility is one of the best ways to ensure more traffic and new potential leads. It also helps with increasing brand awareness. The process of creating online presence includes presenting your company on multiple platforms, such as social media. In this sense, blogging becomes another media where you can present your company. Not only does this online presence help with providing more details about your company, but it also becomes a tool you can use to interact with your audience. A self-hosted blog is an online presence that you can fully control. Unlike social networks or hosted blogging platforms such as Medium, where your presentation depends on the features and the layout provided by the network, with a self-hosted blog you can create a custom layout and install features you find relevant. This is very important to have in mind when designing a business presentation through a blog. To create a blogging presence, start by having a blog that is an extension of your company website. Ideally, the URL should be www.yourcompanywebsite.com/blog. The next thing you need to consider is blog design. Since one of the purposes of the company blog is to provide more information about your brand, the blog design should match the company website. Business blogging is somewhat different from individual blogging. Regardless if you are only starting out your online business and thinking about implementing blogging, or you already have an online business, but you are just beginning to consider blogging as another strategy, you should explore the following aspects as crucial things for your business blogging. What is typical about blogging is the status of an author that may or may not be highlighted. The main reason for this is the goal of building an influencer figure. Bloggers who become respected and trusted by their audience gain this status of being influencers. Their activity is promoted through building a brand around their name. When it comes to a business, there are several options to approach this authorship issue. The first approach relies on using a status of an individual in blogging. One of the members of your team (or one expert guest writer) can become a figure which will carry this task of creating a connection with the readers and promoting your brand through his or her own influence. The main advantage of this strategy is the fact that an individual has an opportunity of becoming an expert, an influencer who will gain loyalty among the readers and thus increase the trust in your brand. The person can interact with the audience in the comments, through emails, etc. Another benefit is the fact that people are more likely to relate to a person, which increases the engagement level, trust, and credibility. The main drawback of this individual blogging is the fact that the reputation is based on a single team member who may or may not be with your company long-term. This can cause issues when and if the blogger decides to leave the team. The other approach companies use is team blogging. With this approach, the focus is on the content and company’s team is signed as the author. In this case, the company decides not to focus on building the influence through personal brand, but instead, it is trying to benefit from the sole content. The great thing about this strategy is the possibility to offer a lot of high-quality content which can be created by multiple authors. You can even completely outsource content creation and hire writers or agencies helping you with it. This strategy lacks the personal character which might reduce its efficiency to connect with the audience and engage with them. Both strategies have pros and cons. The choice should be based on your company’s goals and objectives. As a general rule, small-sized companies are more prone to choose the team blogging approach, while large companies usually have a full-time employee who can focus on the task of individual blogging. Again, the choice is only based on your business and how you plan on integrating blogging with it. Once you have the authorship all sorted out, it is time to focus on your blog’s voice. As a business, you have to define what kind of an approach you want to use when addressing your target group. You might want to be formal, you might want to use a more colloquial language. You might want to share your own experience (helps with enabling the audience to identify with you more easily) or you might want to use statistic details and case studies for reference. It completely depends on your business and the type of audience you are trying to reach. Always have in mind that your blog and its content represent your business. Your potential and current customers will read this content, so you want to give them something that they can understand, they can relate to. You need to write in a way to gain interest, deserve respect and credibility while fulfilling the need to provide useful information about the topic. To achieve success with blogging, you have to define goals that will affect blog setup, content creation, and content distribution. You need to determine a purpose to figure out how to implement blogging with your business. Why do you start business blogging? Do you want to increase traffic visits? Do you want to use blogging to generate emails and increase sales through email marketing? Perhaps you want to create content that will help with social media promotion? Have you already tried blogging and have some first-hand experience? Answering these questions will help you focus on concrete goals and explore ways you can reach them most effectively. Furthermore, having a purpose with blogging will also help incorporate it into overall business strategy. Since successful blogging needs purpose and specific goals, a blogging strategy also becomes a necessity. Creating a strategy on how to use blogging in business helps you create a plan of actions, that will guide you through content creation and content promotion. This will help you tailor your content to the specific goals you want to achieve and think about blogging as a part of your business. Like with setting up your own business, consider blogging as a project that you want to realize during a particular period with specific goals in mind. Planning business blogging should include everything related to blogging and how to shape your approach into a strategy that integrates well with your business. Another aspect typical of blogging as a business is a promotion strategy. This includes planning blog promotion through various online channels, such as social media, search engine ads, etc. The main reason why promotion is important is the fact that it helps you increase the reach of your content. At the moment you start blogging for business, you might or might not have certain traffic on your blog, or even a certain number of subscribers. Still, the number of visits is probably rather limited. Your promotion strategy is going to help you increase these numbers from which your business will directly benefit. The primary goal of promotion strategy is to increase reach, but other goals can also be achieved this way, such as gaining new readers, lead generation, increasing sales or even brand awareness. Finally, you need to monitor and evaluate the performance of your blog. Despite the fact that blogging is a strategy used by many businesses with numerous studies proving its efficiency, sometimes blogging might not bring the results you expect. Perhaps your goals were too ambitious to begin with, so you consistently fail at achieving them. Perhaps the content might not be performing well, or you have problems with the content promotion. Even if you are successful at completing your goals, and you see benefits from blogging, evaluation of your approach to blogging is still a good way to find out how you can improve this strategy further. All of this can help you determine which content performs best and why. It can also show you how promoting content in different ways can help with increasing its reach. The overall impression of this evaluation should be to detect what works best for your business. Find out which approach is the most effective one when it comes to blogging as your business. As you will find out later on, blogging brings many benefits to a business. One of the main reasons for blogging as a business is to provide more information to your potential customers. The company website provides information to all of the visitors, but this content is more static and general. 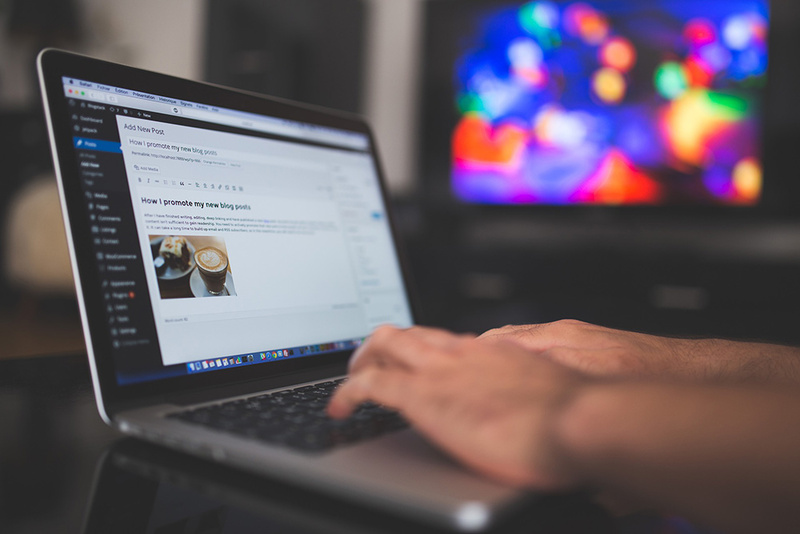 Therefore, a blog is a perfect way to complement your website with more information and content that is more dynamic, which means it is regularly updated. A blog also allows you to implement an abundance of keyword-rich materials which is an ideal way to attract relevant search engine queries and position your blog among the top search engine results. Besides more information about products and product usage, the main distinction a blog can bring to your website is personalization. While website content is more across-the-board, blogging can bring that level of personalization necessary to create a bond with your visitors. Using the status of an individual as a blog author can help you create content which is more individualized and targeted at specific visitors within your target group. The bottom line is that blogging is a part of your business and it has a specific role in online marketing. As you will discover later on in this ebook, it is essential that blogging becomes a part of the overall planning, to be incorporated and coordinated with other segments of your business, to ensure the highest performance.